Source: e-ARC provided by the publisher in exchange for a fair and honest review. Charming, daring, and romantic, Bruno is just the Italian Pippa’s looking for—except she keeps running into cute American archeology student Darren everywhere she goes. Pippa may be determined to fall in love with an Italian guy … but the electricity she feels with Darren says her heart might have other plans. Can Pippa figure out her feelings before her parents discover she left the program and—even worse—she loses her chance at love. Since I am obsessed with all things Italy, Italy-related, and Italian- I knew I had to have this book. :) I adored Wish You Were Italian! 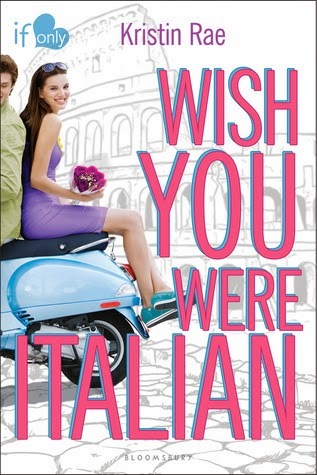 It was a cute, fun, read and I loved being able to travel back to Italy with Pippa and revisit all my favorite places! Pacing: I felt this book was well-paced. I liked the development of the romance as well as how Pippa's journey unfolded. Kristin Rae does an amazing job with her setting. Having studied in Italy, I'm extremely critical when it comes to being authentic and I feel Kristin did a great job of capturing the essence of Italy, as well as Pippa's feelings while she's there. Storyline: Pippa is sent to Italy to study at an art school in Florence. Most kids would love that opportunity, but not Pippa. She isn't interested in that kind of art- she prefers photography instead. However, her parents run an art galley in Chicago and think this trip would be good for her to learn more about art. Traveling alone, Pippa gets a taste of that exhilarating freedom that comes with being in a foreign country with no parents and no one to stop you from doing what you want! She makes a decision, that while a bit reckless and impulsive, ended up being the right one for her. Having stayed in Italy, I can honestly say there was never a point where I felt unsafe or was afraid to go out on my own. Her first day in Italy she meets Darren, a cute American student who may or may not have a girlfriend with him named Nina. The three explore Rome and Pippa finds herself enjoying spending time with them. My favorite part was when Pippa saw the Colosseum for the first time because I felt the exact same way. It is a truly a sight to behold and you can't help but get emotional when you see it! Pippa makes the decision to travel around Italy and pretend she's going to the art school in Florence. She meets new friends along the way and keeps running into one very familiar face during her travels. Her best friend Morgan has provided her with a journal full of goals to complete while she's in Italy and one of them is to fall in love with an Italian! Uh-oh! Pippa girl- sometimes those Italian boys can be more trouble than they're worth! Pippa sets her sights on Bruno, her new friend Chiara's cousin, but it's hard to stay focused when Chiara warns her against him.... and she keeps running into Darren. Characters: I liked Pippa. She's not a girl who is disobeying her parents' wishes just to be disobedient. She wishes they would hear her and take her feelings into account. She doesn't have a very good relationship with her mom, which is why she goes to such lengths to keep her not attending school a secret. She does end up confiding in her best friend, though, which is probably a good thing in case something happened. Pippa finds herself torn between Bruno and Darren and will have to decide if she wants the illusion or the reality. Darren was a bit hard to read. I wish we would have gotten a bit more background on him and learned a bit more about why he acted the way he did with Pippa. He didn't run hot and cold, but he did tend to pull back when things were starting to become more with them. I did like Darren though. I felt he was a more natural fit for Pippa than Bruno was and he seemed to genuinely care about her and what she wanted. Bruno, while gorgeous and Italian, is known for being a player and is rather flirtatious with the tourists. He is definitely on the more reckless side than Darren is, and his actions are a bit self-destructive. I really enjoyed Chiara's character. She was a good friend to Pippa and sweet to invite her to stay with her family in the amazing Cinque Terre. She doesn't want to see Pippa get hurt by Bruno, as she knows the type of person he is, despite Pippa's insistences otherwise. I again wish we could have gotten a little more backstory concerning Chiara and Mauro, as something big happened between them. Final Thoughts: If you are looking for a fun, cute, summer read- this is the one you need! I loved getting to go back to Italy and remembering what it was like to travel around, have that freedom, and eat GELATO all. the. time! Throw in some romance and you're all set! I want to point out that I loved how Rae brought the story full circle at the end with Pippa and her mom. I was really proud of both Pippa and her mom for having the moment they did, as life is too short to look back on with regrets. This sounds like a really fun and cute read- I love these whirlwindish kind of books. Gotta check it out. Great review! I want to be sent to Florence to study - even if it's art! ;) I Wish You Were Italian sounds like a lot of fun, Jessica. I think I'll read it while on a trip this summer, although my trip won't be as exciting as Italy. Nice review, my dear.